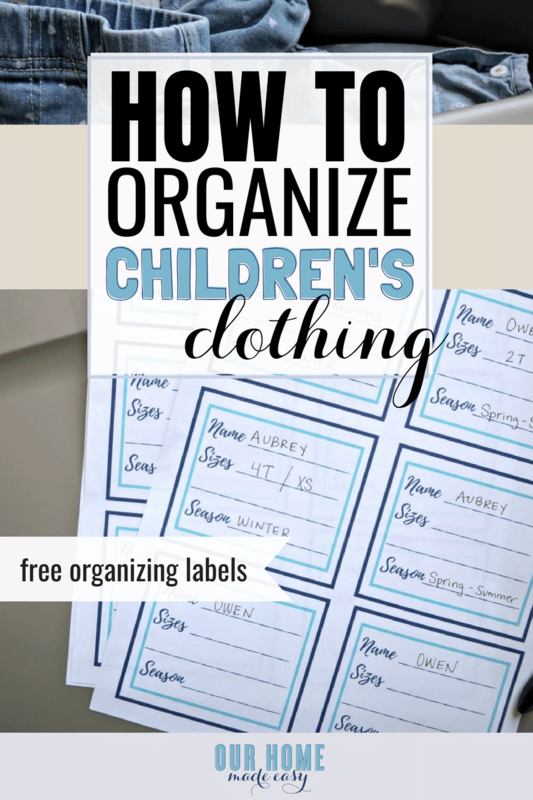 This is the easiest way to organize kids clothing! 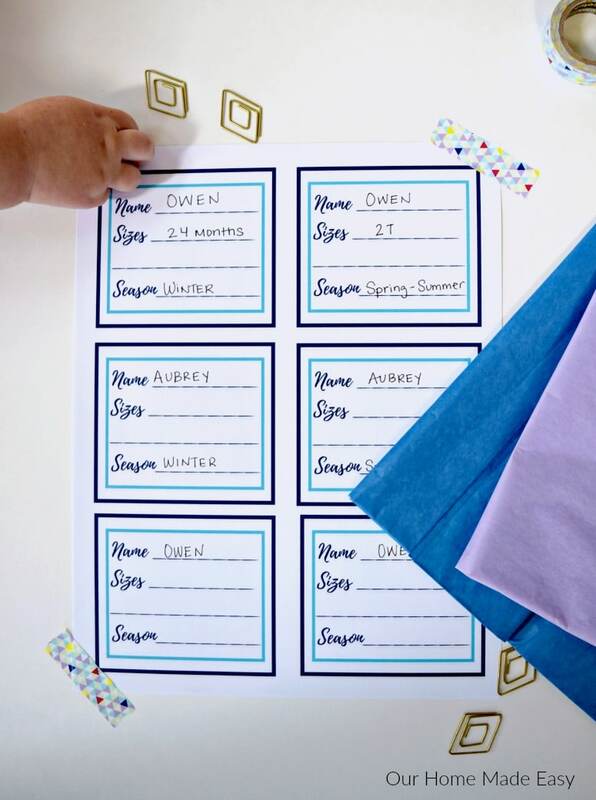 Grab the free printable label to start getting organized today! Do you feel overwhelmed by the constant churn of rotating clothes? Keeping up with multiple wardrobes, growth spurts, and knowing what actually fits these days is no small task. Over the past few years I’ve learned that managing the overwhelm is easier when broken up in pieces. It’s not about gathering and sorting an entire season of clothes at once! 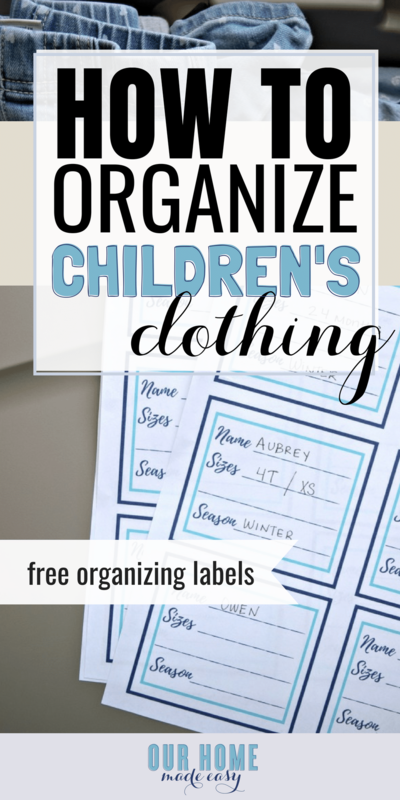 Plus, I’ve created a printable label for you to start your own organizing kid clothing system! I remember how nostalgic I would become folding up baby clothes each time Aubrey & Owen would outgrow their onesies. Then, I’d spend an hour collecting the next size and removing tags. If the items were second hand, I’d have to recall where I’d placed them and which sizes and seasons were on-hand. But I have to admit, after an almost constant churn of clothes for the past few years, the cute nostalgia has been pushed aside to simply wanting to organize everything! Jordan & I have every single piece of clothing that either kid has ever worn. We’ve always thought we’d use the items for another child. But, I’m slowly going through the clothes and giving away what we no longer need (sorry grandmas!). Since I am going through the clothing and still living through the seasonal, growth spurt induced churn of organizing kids clothing, I wanted to share with you a super simple way to create a working system for you! PLUS —- I included a fun printable to get you started on organizing your clothes! Scroll down to the bottom for access to the printable! When it comes to organizing, consistency matters. 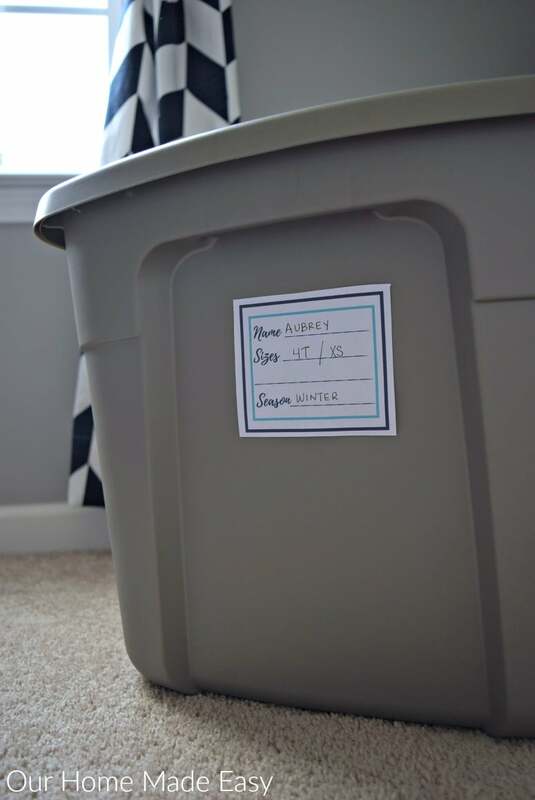 Whether you choose old diaper boxes or totes, stay consistent. We chose these gray totes a few years ago. While I would’ve loved a ‘prettier’ color, we wanted to make sure the totes would be available all-the-time, not just for a season. And I am so happy we did this. It’s made organizing so much easier when it’s always the same tote to find in the store. I also recommend buying totes that have a latching lid. We’ve purchased totes in the past that had click on lids… and they never stayed on! It was so frustrating. When it comes to kids clothing, you’ll probably want to make sure the lids stay closed to make sure clothes stay clean and as dust free as possible. Then if you have a latchable lid, you’ll be able to stack them easily. We all know how quickly these totes can add up in your storage space! Start thinking of the best way to store your clothes. Prettier isn’t always better— availability is! You might be thinking… but who has time to store away whole tubs at a time? You’re so right! Aubrey & Owen never grow out of their clothes in one week. There is always atleast one morning a week where we pull a shirt or bottoms out of the drawer only to find out they don’t quite fit anymore. Take one of the totes you just purchased and leave it in your child’s closet. If you have two kids, keep two totes in the room. As the clothes need to be packed away simply place it in the empty tote. Once the tote is full, start the next step, and place it in storage. Bring out another empty tote to take its place! 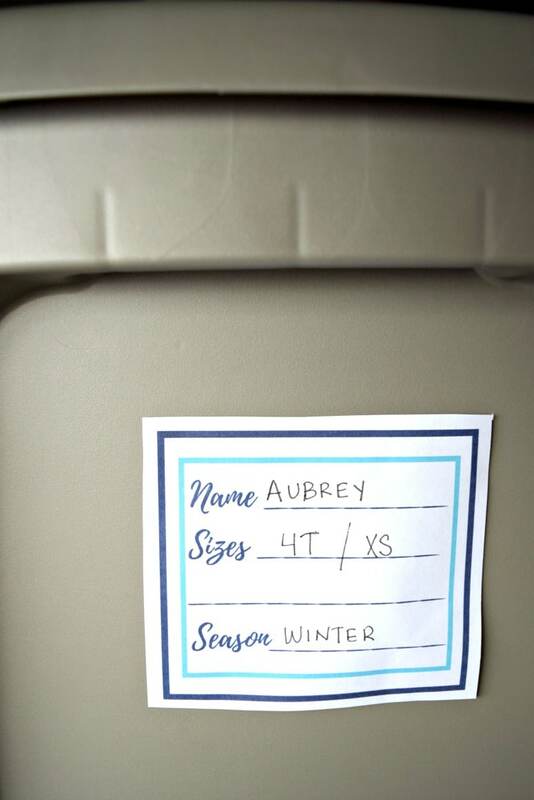 One of the hardest parts about organizing clothing in these tubs is knowing which seasons and sizes are in which tubs. Especially when you’ve collected multiple years worth of clothing! Jordan started labeling the clothing bins with a simple label maker. His system works really well, however it didn’t tell me the season of clothes. When we were in the 3-6 months rage, it was easy to remember which season the clothing was used. But, as Aubrey start staying in the toddler sizes for 9+ months, we crossed multiple seasons. 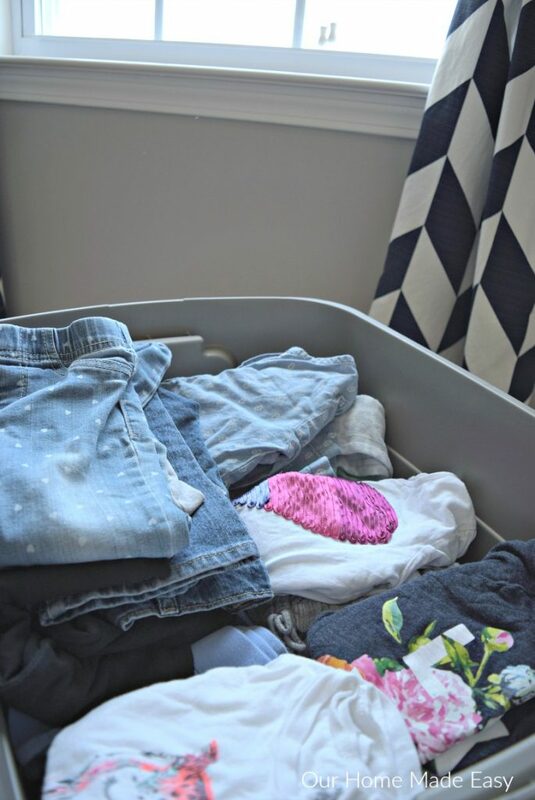 As we’ve decided that we need to start giving away the kid’s clothing (because we no longer need them 😉 ), I’m realizing that we need to know exactly what’s inside the bins as I ask who may or may not need toddler clothing. I created this label to help anyone getting started on labeling the totes. Once you have the totes labeled, it’s time to make them retrievable. Why is that important? Well, eventually you’ll need to do something with those beautifully labeled totes! Or you may want to look at selling your clothes on Facebook or a garage sale. It seems like those sites are perfect for large bundles. When you know the season, you can sell a bundle a month or so ahead of the needed time and have the best potential to unload your items. If you know you aren’t going to have any more kids, or simply don’t have years worth of clothing storage on-hand, you may want to give away clothes to a friend. It’s always great to quickly know what you have on-hand and pass them along. None of us have hours to go through clothes. Breaking them down in small chunks is quicker and makes it much more likely that you can give away the clothes. Don’t you remember how overwhelming it was to receive 2 years of clothes at one time? How on earth can you remember where you stored the toddler clothes that were given to you when you were pregnant? That leads me to my next step…. Never forget a hand-me down again! I remember that when we had Owen, we had so many awesome friends who gave us so many clothes! But I’ll admit, it was hard keeping track of what we’d received. So I started sorting the clothes, even before we ‘out grew’ them. 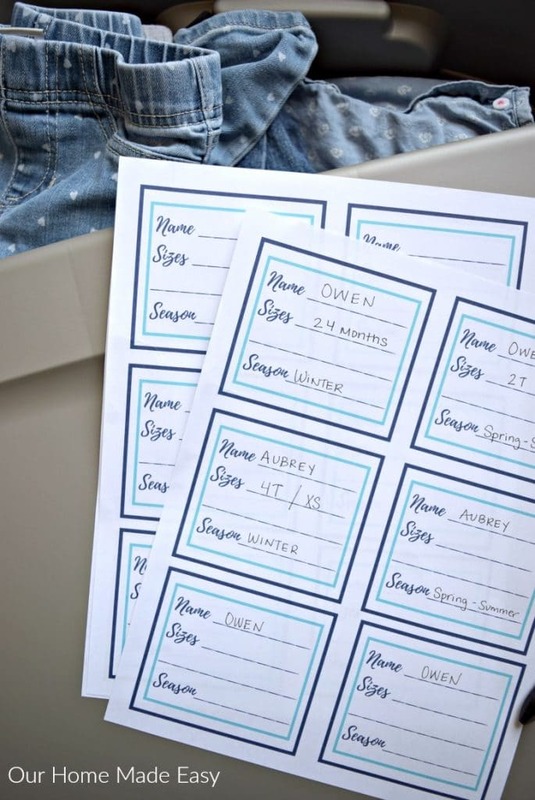 Use the same tote system and label the items just as if the kids had out grown them! This works well if you have multiple friends, sisters, or neighbors giving you clothes. While you may not be able to keep track of who gave you what, you’ll have the sizes and seasons sorted for when you really need them! You already have so much to mange around the house! Keep yourself organized by creating a bin system that works for you. Start by scooping up a few bins and keep one in the closet. As you have time, begin organizing out-grown clothes by size. And don’t forget— always have one empty bin waiting. This will keep your new system moving forward! Genius! The empty tub idea is spectacular. Right now we have a growing “donate” pile on the bottom of our closet. However, I would love to keep some of my son’s clothes and give them to my nephew. I love using the plastic shoebox sized containers to store old kids clothes. They easily stack on the top shelf of my kid’s closets and are fairly inexpensive.